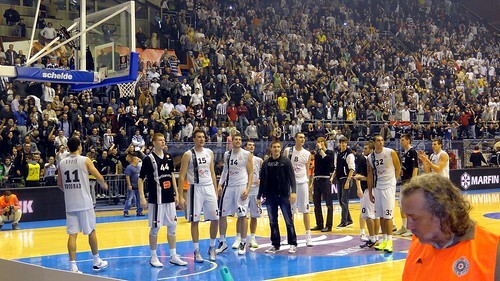 Partizan Celebrates, originally uploaded by bill kralovec. Thursday night I attended the Euroleague Basketball game between Besiktas of Istanbul and Partizan of Belgrade. As a basketball fan, it was almost a religious experience because of the most rabid basketball crowd I have ever seen in my life! Partizan won 87-72 to earn their first win in six tries in this year’s Euroleague, which is the basketball equivalent of soccer’s Champions League. Partizan plays their early round games in the old, state owned, Pionir Hall. The stadium only seats around 8,000 people, but it is very, very loud. We arrived two hours before tip off and it was already almost full. 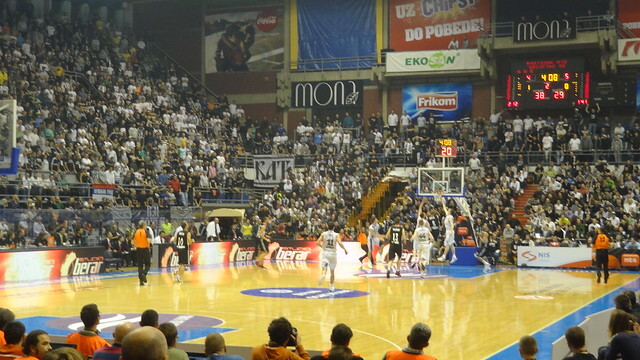 Like soccer fans, the Partizan basketball fans sing many songs during the game, and have impromptu group cheers based on what is happening in the game. For example, when the small delegation of Turkish fans arrived, the crowd started singing about the history of the Serbs,defeating the Ottoman Turks and killing of a particular sultan. Of course it was in Serbian, so I doubt many of the Turkish fans understood. The photo above is from after the game. The crowd and team stayed after and they sing “Partizane!” An amazing, exhilarating experience! It showed the best characteristics of the Serbs, they are a passionate people and love sport. This is for a team that is 0-5 in this year’s Euroleague competition! They have a good, very young team, but with a payroll many times lower than other teams in the competition, they have a difficult time competing year in and year out. Their strategy is to develop young players and then sell them to the bigger teams. This is one of their main sources of revenue. They also get import players who want to make a name for themselves in Europe or who are new to international basketball. The positive is many players want to play for the club because the team is famous throughout Europe, they have an intense training program that develops many players, and of course, they will play in what I argue, it the best atmosphere to play basketball in the world. The experience must compare to Madison Square Garden in New York, or perhaps Cameron Stadium at Duke University. Partizan will improve this year and will be tough to beat next year. They have three 7-footers, Leo Westermann, a French guard that reminds me of the San Antonio Spur’s Manu Ginobli, Drew Gordon, a 6-8 power forward from New Mexico that has great inside moves, and a host of athletic Serbs that can shoot. It will be fun to follow them this season, at least in the Adriatic Basketball League. I will upload a video of the post game singing when I fix my internet connection. I would like to give a big thanks to my friend, and former Partizan player, Jagoš, for taking me to the game and sharing his knowledge of Serbian basketball with me. Well you should have attended basketball derby last week between Partizan and Red Star, where 300 Red Star supporters easily overwhelmed and silenced the self-proclaimed “best basketball fans in Europe”.